Silky Smooth Texture & High Quality At A Value Price. Velourtex starts with a high quality nylon yarn tufted into a velvety smooth texture, similar to late model original equipment floor mats, but with a heavier more dense carpet face. 20 ounces of durable Nylon construction. The multi-layer backing is designed to maintain the mat shape and provide protection for your original carpet. This is the same backing system as Lloyd's higher priced mats and features the non-skid rubber TractionBac™. Choice of Ten carpet colors to complement all car, van, truck & SUV interiors. A 2 year Lloyd Mat limited warranty against defects in design, workmanship and materials. Factory compatible anchoring devices are included with each set for vehicles with a factory installed hook, snap, post, etc. Mats for vehicles without OE anchoring devices, are equipped with Lloyd’s proprietary anchoring system. Mats absolutely stay in place for the safe operation of the vehicle. Mats look better and last longer when they stay in place. Won’t wrinkle or create hazardous driving conditions. Over 6000 unique floor designs. Cars, Trucks, Vans and SUV’s. Patterns available for most van, SUV and wagon cargo areas. Many one-piece full width patterns for greater coverage. Greater floor coverage and protection than OEM mats. 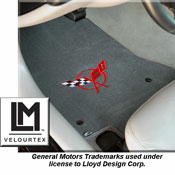 Mats for most cars, trucks, SUV’s and vans from mid 1970’s on. More custom patterns than any other mat manufacturer. Licensed Trademark embroidered designs for 17 automotive makes including: General Motors, Ford Motor Co., Chrysler, Dodge, Jeep, Plymouth, and Porsche®. Over 750 embroidered emblems and designs. Embroidered designs done with durable nylon thread. Direct Embroidery: Designs are Sewn through carpet and backing. Embroidered Appliqué: Pre-embroidered appliqué permanently welded deep into the carpet face us ing RF Technology. Optional marine grade vinyl binding materials. Customers don’t have to “settle” for something they really don’t want. Customers can create their own look. Two Year Warranty against defects in design, workmanship and materials. Custom floor mats are made to order. Please allow 2 weeks for delivery. We have sample mats and color swatches at the store. Stop by and take a color swatch out to your car to compare colors and materials.